This time last year gas prices threatened to put a stop to the great American pastime of.....driving....alone......long distances. And as gas prices rose, so did the number of two wheeled vehicles buzzing about in Downtown Florence. As the weather warms and the sun starts peeking through, I expect to see the return of the two wheelers. 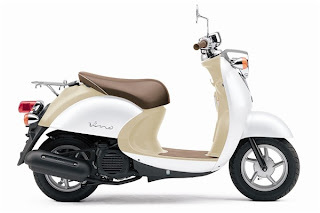 I even jumped on the band wagon last fall and bought myself this beauty of a scooter! It is the perfect vehicle for toodling around downtown! I love the days I get to drive it. People smile and wave as you pass, some even giggle a bit but they all stop to see what you are driving. (I am sure they just want to be sure I am safe!) So get out and enjoy the friendliness in downtown. If you have a scooter or motorcycle, jump on it to come eat or shop or even just to spend the afternoon in the park with friends. If you aren't fortunate enough to get 80+ miles per gallon, wave to the friendly motorcyclists and scootists (what in the world do we call ourselves?) as they pass! It will make their day and yours!